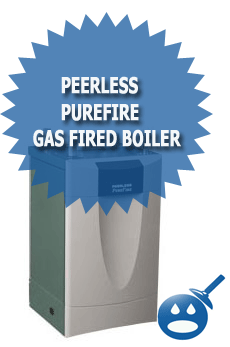 The Peerless PUREFIRE Gas Fired Boiler is one of the company’s best selling boilers. The PUREFIRE can effectively and efficiently heat your home for less than other boilers. This boiler is an Energy Star Rated Boiler, which means that you can rest assured knowing that this boiler is energy efficient and it will save you money but in addition you are eligible for a tax rebate because the PUREFIRE has an energy efficiency rating of 97.3%. 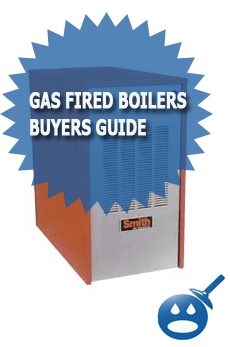 This residential gas fired boiler can be used with either natural gas or liquid propane. The PUREFIRE Series contains six different models to choose from depending on your application. Some of the features available on the Peerless PUREFIRE are the supply and return pipes, the pre-mix burner, the service switch and the reliable dual flame sensors. This series includes a built in condensate neutralizer system complete with float switch protection, state of the art control board with advanced features, an outdoor reset and a domestic hot water priority to list just a few. The standby temperature for the domestic hot water is controlled with a low fire operation. The control board is an LCD display with easy to understand readouts. 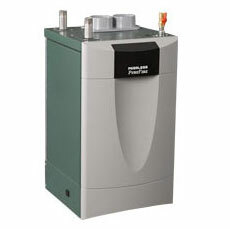 As we mentioned there are six PUREFIRE Gas Fired Boilers in the series, the PF-50, PF-80, PF-110, PF-140 and the PF-210. The minimum input MBH range from 16,000 to 42,000 and the maximum range from 50,000 to 210,000. The heating capacities range from 46,000 to 192,000. The PUREFIRE models listed are all for residential application, there is a commercial model PUREFIRE, PF-399. 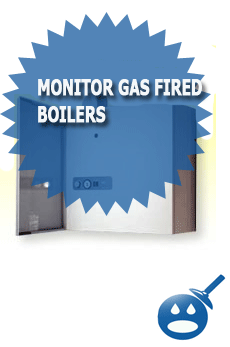 This gas fired boiler has a minimum output of 80,000 and a maximum of 399,000. The gross output on heating capacity is 373,000. All of the PUREFIRE Gas Fired Boilers are compact and do not take up much room, so you have more flexibility on where to install the units. They are all environmentally friendly with a low NOx operation. These boilers can cascade up to 16 boilers. These boilers all meet all federal tax credit requirements. So you can save money on purchase and on your energy bills. These units are residential gas fired boilers and they are made with a strong stainless steel construction. 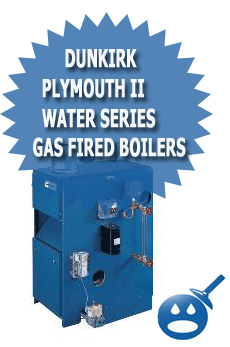 The venting systems available on these boilers are sealed combustion or direct venting. The combustion system is a direct spark system. The Peerless PUREFIRE Gas Fired Boilers are all pre-mixed with gas burner technology and they are all factory tested before being shipped out. The PUREFIRE Boilers have zero clearance for combustibles and access to the controls have never been easier. Peerless Boilers offer a warranty on all of the boilers; the PUREFIRE offers a complete one year warranty plus a one year warranty on the parts and labor. You must register your warranty information in the allotted time for the warranty to become active. Make sure that you read all of the warranty information before registering. If you want more information on any of the PUREFIRE Boilers, contact your local Peerless distributor.